There are many magnet types varying in cost, corrosion resistance, temperature tolerance and field strength. These properties result from different shapes and constituents with common types of magnets including neodymium, samarium cobalt and ferrite/ceramic magnets. The type of adhesive recommended for each depends on the intended use, the material coating the surface of the magnet, if any, and the material to which the magnet is bonded. Many neodymium magnets have a nickel coating and epoxies are best at bonding with the nickel plating of the magnet. Samarium cobalt magnets do not require coating and can be used for higher temperature applications up to 350 degrees C. These high temperatures may require specialized ceramic adhesives to tolerate the heat. Ferrite or ceramic magnets are common due to their low cost and don’t require coating. Many common types of structural adhesives can be used with ferrite magnets. As a manufacturer of high-performance adhesivesm Hernon Manufacturing regularly receives requests to advise on magnet bonding applications. 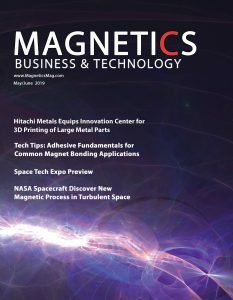 This article addresses some of the most common magnet bonding applications that we encounter and important aspects of their adhesive requirements. Magnetic drain plugs are mainly used to trap and remove microscopic metal particles from engine lubricating oil. The drain plug protects engines and industrial equipment from metal particles by pulling them from the oil. 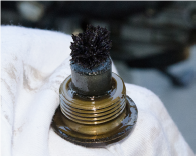 The magnet in these drain plugs is typically a tight fitted cylinder attached to a threaded cap as pictured. The family of adhesive required for this application is a retaining compound. As with many magnet applications a drain plug is often found in a high vibration environment with occasional impacts from motion. Heat cycling can also affect the bond as the engine warms and cools. Another key factor is oil exposure. Any adhesive for magnetic drain plugs must tolerate long term exposure to a variety of engine fluids. Magnets play a key role in audio speaker functionality. For the speaker to work properly, a strong bond needs to be formed between the magnet and poll piece as well as magnet and base plate. This provides the magnetic structure for the voice coil to move through creating vibrations and moving the speaker cone to make sound waves. Vibrations can play havoc with mechanical fasteners while the flexibility of adhesive bonds protects speakers from damage by strong vibrations. Magnets in electric motors are bonded in place with adhesives for several reasons. Magnets are brittle and susceptible to fracturing. Adhesives disperse stress across the entire bonded surface, reduction stress focus points and mitigating fracturing risk. Due to the high vibration environment, any space between components will allow for vibration and increased noise and wear on parts. This is especially important for coated wires which can be delaminated by the vibration resulting in a short. Adhesives minimize noise and vibration due to their visco-elastic properties. Adhesives also bond to a variety of substrates including metal and plastic materials and produce strong bonds very quickly making them an ideal choice for large scale manufacturing. In summary, the variety of magnet bonding applications is as varied as manufacturing itself. Each application offers unique challenges from different substrates to thermal changes, chemical exposure, vibration and more. Adhesive manufacturers can help you select from the thousands of adhesives available to find the best match for your specific application. 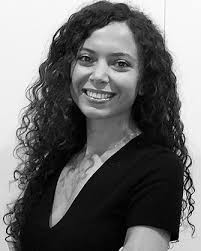 Simla Ay is a technical writer with Hernon Manufacturing, Inc. of Sanford, FL. Hernon manufactures adhesives, sealants and processing solutions including precision dispensing equipment and customized formulations. For more information, see www.hernon.com.